This post is evidence that I am ready for warmer weather - and spring flowers and softer colors. What is up with this crazy weather?!? It is so cold - and the past couple of days have been high winds with brutally cold air. I am still wearing hats and my hiking (snow) boots. I don't mind so much wearing my boots - because I love them - but I am ready to wear pumps! And, I am pretty excited that I snagged these white booties in my size - and I can't wait to style them different ways this spring. Also, I wanted to mention that this look has some great deals - like the $18 blouse (that comes in other colors) and the pumps are 30% off. And, the jeans are under $40! This summer black dress is only $25. These pinstriped pants are only $20 - and could be great for work. This cute leopard tote is only $30. This cute polka dot dress with flounced sleeves is only $25. This ruffle blouse is 40% off - and looks so comfy and cool for summer. This really cute LBD lace dress is 40% off! I am really into knit tanks for summer - like this one. Backpacks are having their moment - and this cute white one is only $60. The saying on this tank - made me laugh. This sunny peplum top for spring! I found this popular round straw bag for only $14. 1. These cute striped blouses are under $25 - and additional 25% off! There are also ruffle sweaters/sweatshirt for sale under $20. 2. These cute floral dresses for as low as $20. 3. Popular wedge espadrilles are $60 with the sale! 4. And, these really cute velvet espadrille mules. 5. These trendy and popular bags - like this pink backpack that is 50% off on sale! 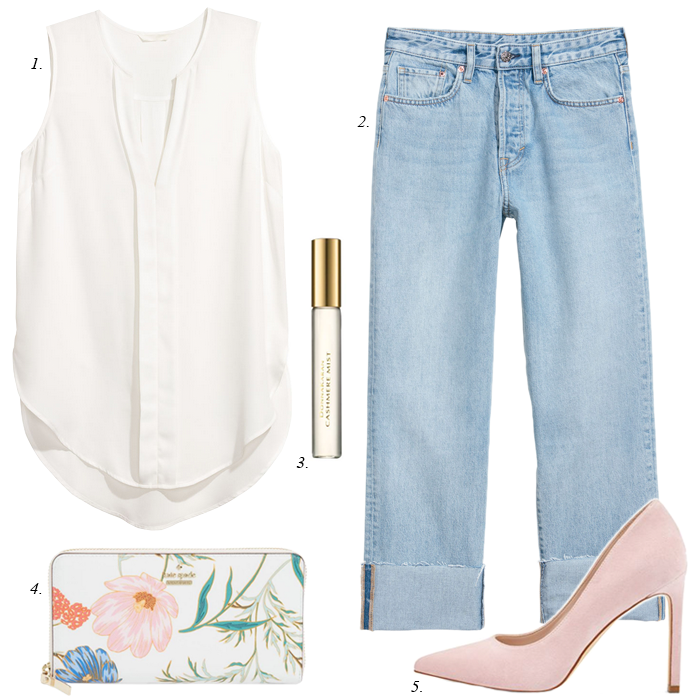 Love this perfect spring outfit! Now if the cold would just go away! So much to love in this post! I am over the moon in love with that asymmetrical peplum - it is gorgeous. That round straw bag is such a fabulous find and a great price, love it!